Item number 07.467.8308 from the Brooklyn Museum. This is a conical shaped basket with a stepped flag design in brown on natural fiber colored background. The shells and feathers are fastened to the exterior and extend out from basket. 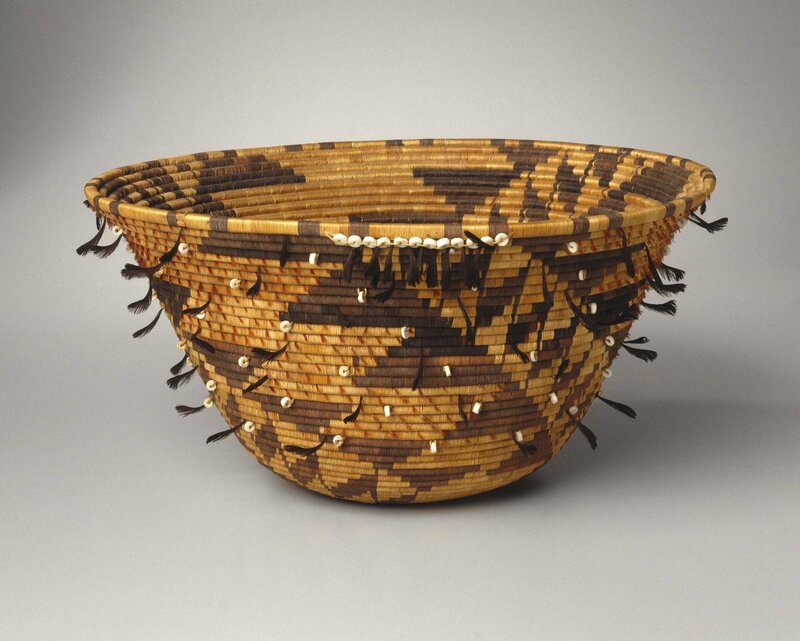 Although called a puberty basket it is thought that this basket was not necessarily used for puberty ceremonial. At the time it was collected it was thought that ceremony no longer was being practiced so such baskets were no longer being made for traditional practice. While it may have been intended for such, there is no physical evidence that it was ever used to hold water, and it is more likely that it was made for sale, an aestheticized version of a traditional form.